Is your workplace a fabulous place to work? Or is it a place where people are merely numbers on the balance sheet? Stress is everywhere. It is on the increase. Stress is misery for the individuals and is one of the main impediments to personal and organisational performance. For some organisations, further stress is caused through mergers, acquisitions and take overs to grow the business. These activities often result in having conflicting cultures, increased and persistent demands which outstrip the workforce’s capacity to cope, and changing skills requirements which the workforce cannot provide. All this adds to the stress of individuals and impedes their performance. More than ever, the workforce needs greater resilience to be able to cope with these events, and with the behaviours of people at work under strain. Resilience is about forming strong attitudes, strong enough to work out strategies to cope with stressful situations and people. 2015 is going to be a year when organisations need to really look after their workforce – a preventative approach to stress and a positive approach to wellbeing has never been so critical, and the creation of a sustainable, psychologically healthy working environment so important. People have been asked to do more for less for a long time and it is becoming the current accepted way of working. Add globalisation, 24/7 working, mergers and acquisitions leading to the imposition of new cultures, a focus on profitability or reduced costs and budgets, and add an economic up-turn bringing a raft of new challenges including a skills shortage, and it is little wonder that stress, burn out, dis-engagement and psychological presenteeism (people being present at work in body but not in mind) are on the increase! Existing strategies for reducing stress focus on managing it – waiting for someone to become ill or maybe leave. This involves massive cost to the organisation and misery for the individual. Psychological presenteeism (which occurs during the period leading to someone becoming ill) is largely ignored despite its huge cost. A more cost effective and humane approach is to prevent the risk of stress arising in the first place. This is achieved by creating and sustaining a psychologically healthy organisation and ‘making the workplace a fabulous place to work’. 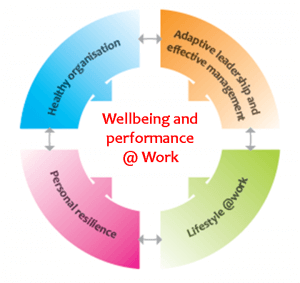 It is commonly accepted that mental wellbeing has a positive impact on performance. In the workplace, managers have a lot to do with helping employees feel great and mentally well. They can help and they can hinder. Leaders and managers operate at all levels of the organisation. They set the tone, the culture and climate and the expectations for the workforce. Managers wield enormous power over others. It is important that this power is used to facilitate mental wellbeing and performance at work for organisations to achieve consistent peak performance. helping their staff cope effectively with daily working life by preventing events and behaviours that can cause stress. behaving and acting in ways that provoke their staff to have positive attitudes towards them. preventing the need for their staff to call on their resilience at work. Managers and organisations have to adopt an attitude that provokes a positive feeling amongst the workforce for the work they do and the organisation that provides it, if they wish to exceed expectations, out-perform their competitors and achieve great success. Call us on 01405 768 900 or email sales@andrewsautomation.box to discuss how we can make your workplace a healthy environment.